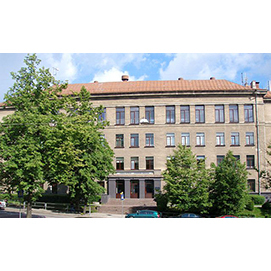 The Faculty of Economics is one of 7 subdivisions of Vilniauskolegija / University of Applied Sciences. 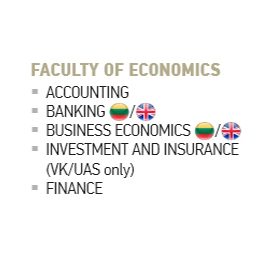 The Faculty’s of Economics origin goes back to Finance and Credit Technicum established in 1945, restructured in 1991 into Vilnius Higher School of Economics. 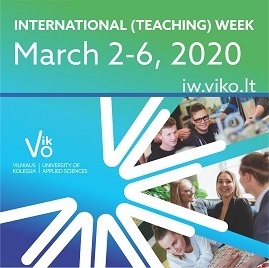 Since 2000 – Faculty of Economics in Vilniaus kolegija / University of Applied Sciences, where currently 978 students are enrolled. Specialists of economics, finance and accounting trends corresponding to the needs of the labour market are trained at the faculty. The Faculty of Economics is committed to providing an education that has contemporary and professional relevance. The courses provide students with analytical and numerical skills that are keenly sought by employers. The Faculty of Economics provides higher education college studies focused on practical activities. Being open to innovations and corresponding labour market needs the faculty offers 5 study programmes: Business Economics (economics study field; language of instructions Lithuanian and English), Accounting (accounting study field), Banking (language of instructions Lithuanian and English), Finances, Investment and Insurance (finance study field) studies and consultancy activities are carried out. Study duration is 3 years for Full-time studies, Full-time sessional studies and 4 years for Part-time studies. Graduates receive a Professional Bachelor’s degree. The Faculty closely cooperates with other educational institutions, state and business companies. The study programmes implemented at the faculty are very popular: a good image of the faculty on the community level, study programmes are in great demand, excellent response from employers about graduates, good employment opportunities, highly qualified lecturers. The main focus is on the quality of studies. The study programmes are constantly renewed according to the changing requirements of the market, the recommendations of social partners and the experience of foreign educational institutions. Students have good study conditions: modern facilities, cosy, up-to-date auditoriums, access to the internet and intranet, a constantly renewed computer network, a methodological studies base is being developed, learning material is available on the studies base is being developed, learning material is available on the virtual learning environment Moodle. Publishing is carried out. A vast collection of books may be found in the library. The working places in the library are computerized, computer programs are constantly being updated. Final practice is performed in real business enterprises, organizations, banks, insurance, financial, other institutions and in practical business training firms “VIKO Bankas” and “VIKO Drauda”. Every year “Career Days” are organized in the faculty during which students have the possibility to communicate with enterprise representatives, discuss issues concerning both place of work or practice. There is a high demand for college graduates in the labour market. Up to 90-82 % find a job which corresponds to their acquired profession and in doing so also have the possibility to make a career. A great number of graduates continue their studies at university. 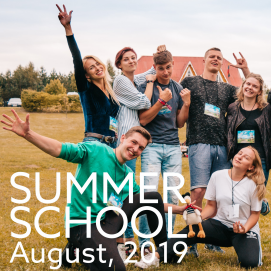 The faculty is in close contact with social partners, employers, associations, cooperates with the Economics Faculty of Vilnius University, Mykolas Romeris University, Vilnius Gediminas technical university, collaborates with other higher schools, state and business companies. A number of cooperation agreements have been signed. All the necessary conditions not only for an active students‘ life but also for self-expression: those with a touch of the artistic or a love for sports are always able to pursue their activities. The college is famous for its dance ensemble „Voruta”, the girls‘ choir „Vaidilutės”, folk ensemble “Želmuo”. There is a Physical Education and sports Centre (basketball, volley-ball team, football team, track and field athletics). Students have the opportunity to participate in different events, competitions, conferences, and also to participate in the work of the Students’ Council, the Financiers’ Club, the Young Economist Club, the Students’ Scientific Society. According to the international student exchange programmes students can continue their studies in higher institutions abroad and also perform practice, acquiring international work experience and getting to know the culture of the country. According to the Erasmus + exchange programme the students of the faculty, starting from the second year of studies, can study (for one semester) in foreign higher schools and carry out professional practice in enterprises in a country of their choice: Belgium, Bulgaria, the Czech Republic, Cyprus, Denmark, Greek, Spain, Cyprus, Croatia, Latvia, Poland, Holland, Portugal, France, Romania, Turkey, Hungary, Germany. Students from foreign countries are also welcome to enrol in several modules or study programmes in English language (Banking, Business Economics).